The Mobile Work Station® is perfect for adding capacity and flexibility to your finishing operations-without overextending your budget. 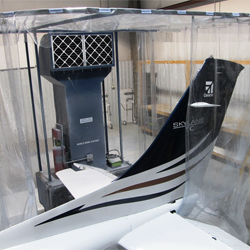 This complete portable booth allows you to perform limited high-quality painting and refinishing without a dedicated fixed-position spray booth. Each unit comes with a sealed, in line direct drive hazardous location 1-1/2 hp motor/fan assembly and hazardous location controls. The motors can be set up for 115 Volt or 230 Volt single phase power. The fans feature a backward curved non-overloading aluminum (non-sparking) fan wheel constructed with hollow airfoil blades, and an aluminum inlet cone. The fan wheels are statically and dynamically balanced to provide higher airflow performance at less horsepower and with minimum noise. Lab tests show the Mobile Work Station® – complete with multi-stage filtration and a patented recirculation design-removes 99.78% of paint overspray from the air, and carbon filters remove odors and VOC’s. 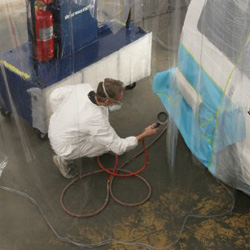 It also eliminates the need for costly building and ventilation modifications, and dedicated shop space. Model No. 5460A – This unit is equipped with all the features of the Model No. 5450A plus a dry chemical fire suppression system. Model No. 5410A – This unit is equipped like the Model No. 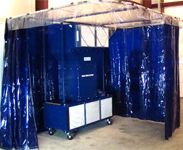 5460A with the fire suppression system and the attached curtain enclosure assembly (10′ x 10′ x 10′) that is larger than our standard models and has heavier gauge enclosure supports.